When XBMC Android development was announced in 2012, the main development platform was Pivos XIOS DS, a TV Box based on Amlogic AML8726-M1 that can run either XBMC Linux or Android, and the company (Pivos Group) was the main sponsor and contributor for XBMC on ARM. Contrary to many other companies that push faster and faster hardware, Pivos Group focuses on software and user’s experience, and they’ve just announced he successor of the Pivos XIOS DS, called the Pivos XIOS XS powered by Amlogic AML8726-MX dual core Cortex A9 processor and feature their own heavily custom version of Android called ToFu Media OS. 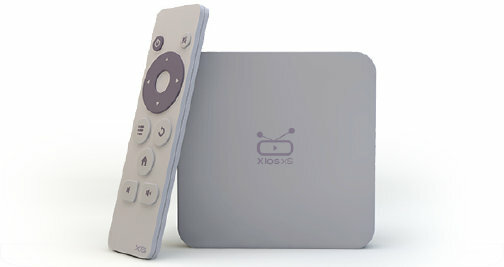 The box comes with XS remote an RF remote specifically designed to be used with XBMC. From the hardware side of things it’s pretty similar to devices like G-Box Midnight MX2 or Tronsmart Prometheus which were released about a year ago. So Pivos XIOS XS must differentiate itself through its software implementation and user interface. Their OS combines a fork of Android and a fork of XBMC, and all you will see is there custom user’s interface based on XBMC, no Android Home Screen, and you have a pure set-top box experience. According to an article on Wikipedia, ToFu Media Center has already been deployed in Playjam Gamestick. Pivos XIOS XS should be available in June, but pricing has not been disclosed just yet. You can get a little more information, and/or signed-up to be notified when the box goes on sale on Pivos Group website. Pivos’s lead developer Scott Davilla, wo also is a member of Team-XBMC, wrote on the xbmc.org forum saying that the key words here regarding the XIOS XS are “new low-end entry-level model”. Reason for that is it is important to know that this is just the first in a series of new XBMC and Android based media players from Pivos. As they are also planning on releasing a middle-end mid-level model and a high-end high-level model, and the price and performance will reflect those different levels. But it is correct that Pivos with this TOFO platform is for all levels aiming for as much as possible the perfect out-of-the-box experience, with automated updates being pushed out, and everything just working without users having to hack the box or install and update anything manually like all China boxes out there. You won’t be. Not legally at least. Well not unless the manufacturer of each of those generic China boxes enters into a partnership with Pivos to license the use of TOFO Media OS on their specific box and agree to pay royaltees to Pivos. As I understand it the main reason that they choose to fork Android to create create TOFO Media OS and choose to fork XBMC to create TOFO Media Center was to stop manufacturers of Chinese generic boxes to use Pivos images on their boxes. Which is why they trademarked And copyrighted TOFO so that they can sue if someone elese use their brand name in other products without their permission. Imagine yourself if you as a commercial company do all the hand work on creating a custom firmware image then a company in China just rips that image and start selling cloned boxes with your image which will eat into your profit margin as that Chinese company can sell it much cheaper because they did not have to spend time and money on research and development. The end users of the Chinese clones then get pissed of at Pivos when they do not get support from the Chinese maker since they have no internal developers so the users try turning to Pivos and get pissed of when they will not help them with the users clone. Now the maker of those clones at least have the option to license Pivos TOFO image so their buyers can get support from Pivos if they use TOFO. Or they can choose to still clone that firmware image but then they must rebrand it so that it does not say TOFO anywhere, remove TOFO skin texture and pictures, and not use anything in that image that is not open source. i guess some one clone tofu and name it something else. you never know maybe there will be more then one.